While we are on the roof of your home or business, a check of your gutter system will be accomplished. Many times wildlife will enter through the gutter system due to the gutters being clogged which causes water to rot the fascia behind them. As pictured, this rotted fascia makes it easy for squirrels to penetrate and create a hole into the soffit and ultimately gain access to the attic. Clogged gutters cause extra weight that leads to added strain on the mounting brackets that support the gutter. 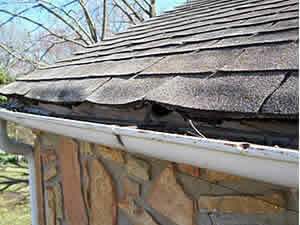 This extra strain may cause the gutter system to loosen and become disconnected from the fascia. The gutter can potentially fall off the house, ripping off the soffit and fascia on the way down. Now you not only have to replace the gutter system, you also have to repair the soffit and fascia, adding to the cost of your repair bill. Gutters should be cleaned at least twice a year. Springtime brings new leaves and flowers on the trees. This flowering will fill and plug your gutters. The fall of the year brings the largest leaf fall and quickly fills the gutters. Our gutter cleaning services will remove all of the debris and ensure your gutters and downspouts are clear. An assessment of your fascia and soffits will identify any areas where wildlife can access your home. Recommendations for maintenance or repair will be provided. We can also install state of the art gutter protection devices so you can end the gutter cleaning cycle once and for all. Enjoy a maintenance free home or business with our gutter cleaning and gutter guard installation.